NEVER UNDERESTIMATE WHAT YOU ARE PURCHASING. To smell is a gift and most often we shop with our eyes and nose because trying products first isn’t always an option. This is why you’ll see customers hovering around the sample booth on the weekends when the aroma of food permeates the air. 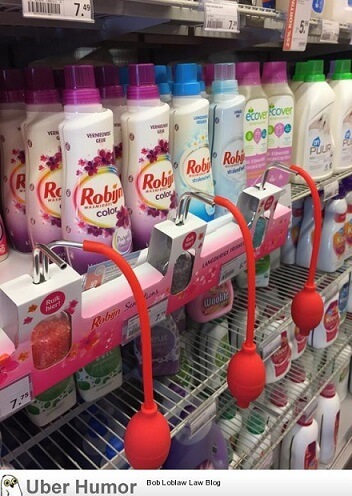 Even displays of household products become attractive if customers are able to see them work. Costco is another store that offers samples to customers and the smell hits you the moment you walk in the store. It’s not uncommon to find out that a grocery store has artificial aroma sensors strategically placed around the store to motivate shoppers to buy more. These scent machines are far less expensive than hiring a sample company and they work. Sniffing and smelling both have the same meaning and when it comes to product purchases we should be using our nose smells to guide our wallet. Let’s forget about all the genius ways the stores are marketing the air sniff to capture customer attention and focus on our own nose for a moment. Question: Price or Smell? Which is most important. Only pick 1. If both is a MUST will you pay more money? Both is a must. I will wait for a sale to stock up and I will even stock up if I’m already stocked up from the last sale. CanadianBudgetBinder Judy Finch Conte stock up the stock up lol. So if you find a brand that smells good you’ll wait until a sale comes around then stock up otherwise no you won’t buy it at regular price. Exactly except I need unscented products or stuff that smells like a pure citrus. You wouldn’t believe how many “unscented” products still have a light perfume scent to them. CanadianBudgetBinder: Judy Finch Conte is that false advertising in your eyes? Judy Finch Conte: Not really. It may not have perfume added but the other ingredients combined kind of make its own scent or it could be the smell of plastic. Fair enough I thought and all the better reason to sniff what you buy IF you can without opening a sealed or boxed product. Many other fans chimed in with their reaction on the sniff test and surprisingly many of them do smell before they buy. Others are a bit hesitant or feel awkward as it’s not a practice you often see people do and if they are it’s done quickly. 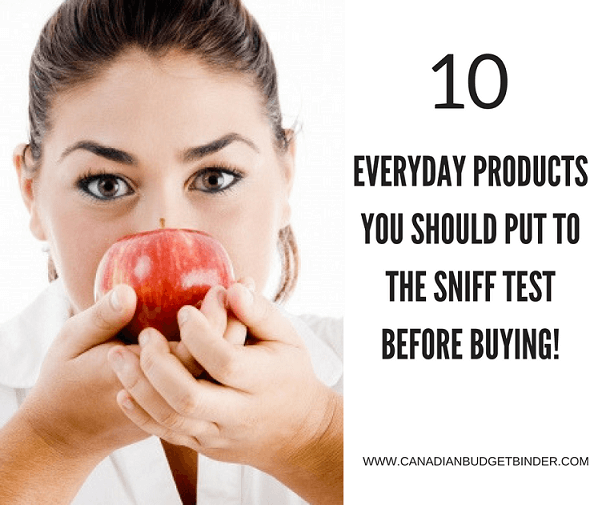 So what are some products you should do the sniff test on before you buy? I came up with 10 or so products with the help of my fans and Mrs. CBB. I don’t know about you but adding sniff time to grocery shopping might cut into my lunch hour but if you fail to take a moment to do so you’ll likely end up with items you don’t want. Every good chef who buys produce at the market or grocery store smells everything they purchase. Why? It’s the difference between a ripe and sweet product to a hard and bland product. If you’ve ever grown a garden before or purchased organic fruits and vegetables right from the farm you’ll know what I’m talking about. Smelling what you will be eating is a good sign of what the fruit or vegetable will taste like. A pineapple when ripe will be golden brown and you should have a sweet smell from the bottom of the fruit. If you don’t smell your fruit is not ripe or it will be lacking in flavour. The same goes for strawberries. What you smell is what you will taste in your mouth. Can we really do that? Taste what we smell? In many cases yes and this is why we drool when intoxicating smells permeate the store that we love. To sniff coffee is a must for us especially if we are buying coffee beans. The easiest way to sniff coffee beans is simply smell the bag. The aroma of coffee and coffee beans is so potent that your nose can smell it from a mile away unless it’s in a tin or vacuum sealed package. The reason we do this is because it gives us a sense of smell the coffee will produce as well possible flavour. Just because a bag of coffee beans sounds exotic doesn’t mean it tastes the same way. I’m a picky person when it comes to smells on my body whether it’s deodorant, shampoo, conditioner, body wash, bar soap, shaving cream etc. Although I’m not able to smell everything I will check for testers or take the lid off to see if the product offers a scent even if the product is unscented. Fresh bread will smell like fresh bread but day old bread will smell like day-old bread. The yeast in bread offers such an amazing smell when baked that it’s hard not to imagine melted butter on a bun or stuffing bread with deli meats. Try it next time you go to a bakery and you’ll see what I mean especially if you buy specialty bread with herbs and spices or sun-dried tomatoes. Unfortunately if you are buying pre-packaged bread you get what you get. Any of you shoppers out there that love scented candles, air fresheners and incense likely can recalling going in for the sniff test. It’s almost inevitable that every shopper sniff a candle before buying it which is why you will notice scratch and sniff labels or openings on the jar or lid. This is also a marketing ploy so the scent of the product hits you as stroll by. You know the same way you stop and glance into Bath and Body Works with a lust for a sniff or with disgust. Please smell the perfume you are buying and if you can’t then I’d say leave it for someone else to buy. Mrs. CBB used to sniff the Este Lauder Beautiful perfume every time we went into Sears with a spray or two. The perfume was horrific smelling to me and I was hoping she would never buy it. I was honest with her. We do the sniff test on each other. If we aren’t both attracted to the smell then why buy it? I really don’t want to scare my wife away from coming close to me. Have you ever noticed an influx of brand new bottles of perfume and cologne on Kijiji after Christmas? Now you know why. Just because you like it someone else might not. I will sniff spices when I can because if the aroma is pungent I’ll know whether it’s fresh or not. You can’t always tell depending on what you buy or if it’s pre-packaged you might struggle. Some spices are very strong-smelling even in a package so don’t be afraid to wave it in your face for a sniff. The bulk spice section at the grocery store or bulk store is a great place to do the sniff test. Old spices lack flavour and alter the expected taste a recipe should have. I read somewhere online once that a lady bought laundry soap that ended up smelling like melons and so did she for a month. It may sound funny but when you only have limited funds and buying another jug is not an option then it can be depressing for someone. Most stores though will take opened product if you explain how horrible the taste or smell was as long as you provide a receipt with-in 30 days. We’ve purchased dish soap because we had a coupon only to find out it was horrible smelling but we used it because we had already bought it. These days we do the sniff test. Some chemicals mixed together often change the smell of the product or what you think a flower scent should be doesn’t often end well with some products. When Mrs. CBB was in the UK she passed the sniff test walking down the cleaning products aisle at Tesco. Our liquid fabric softener tends to be far stronger in the UK than in Canada. Mrs. CBB was swept away by the smell of one of the softeners and actually bought 2 bottles to stuff in her suitcase and bring home. We always have a laugh about some of the stuff she flew back to Canada and what the customers officers must have thought. Always keep in mind that some people may be sensitive to smell so it’s important for them to know what they are buying first. Apart from scratch and sniff, opening bottles, sniffing packaging some manufacturers will offer a sample sniff stand attached to the shelf. It would be the equal to what you’d find in the beauty boutique at Shoppers Drug Mart when testing perfume and cologne. The photo on the left depicts air freshener sniff testers at a grocery store. You either hate smelly cheese or you love it. If you’re not a fan of stinky cheese you should probably buy your cheese somewhere that you are able to taste and smell. Many local deli shops will do just that for their customers by offering a taste but don’t expect them to hand over an entire brick of cheese for you to sniff. That would be against health and safety standards. No sense bringing home expensive cheese that you won’t eat because of the smell. Pass the sniff test first and you’ll be safe in the cheese department. If it smells like the Lake or Ocean you’re in good hands. If not leave it alone. If you can’t smell the fish you are buying I wouldn’t buy it either. Any fish in a can or pre-packaged is at your discretion of purchase. Sniff if you can sniff walk away if you can’t unless it doesn’t matter to you. Some shoppers could care-less. Save yourself the financial loss of food waste or buying products you don’t like by taking a moment to sniff what you put in your shopping cart. Don’t put the product so close to your nose that it touches it or stick your fingers in to taste or try unless you’re buying it. Most beauty shops offer sample bottles that you can sniff test before you buy, including perfume. Remember customers will be eating what you touch. This is why you should always WASH everything you purchase in the produce department or have picked by someone else. A good vinegar and water spray or bath is a great way to keep produce fresh, crisp and clean. Congrats to Ballot #4 Christine for winning the February Grocery Game Challenge! WOW, cutting it close this month especially with one week left to go as there are 5 weeks of grocery shopping in March. It was hard to pass up the 50% off meat at Zehrs even though that’s not why I went in there. I know it’s so hard BUT meat is so expensive. The good news is we have $1.40 plus our stockpile budget of $14.00 in case of emergency shopping next week. Next month we’ll be doing some stocking up. That’s our food shopping week!! Our March goal was to limit ourselves to one more shop for perishables only, but we ran short on a few things. We also took advantage of sales and came across some too-good-to-pass-up instore discounts. Only $9.97 left for March but we should be fine until April. The sugar is stockpile. The meats and potatoes are cooked, divided and in the freezer so the portions should last well into April. We are on track to save $1000 over last year’s grocery bill by the end of April. I’ve been putting the savings aside to put down on our mortgage as soon as we reach that milestone. I’m including this goal with our grocery shop post to help hold us accountable. I’m a little worried we’ll find something we’ll convince ourselves we absolutely “need” to spend that money on before it makes it to the mortgage. What an awesome goal!! You’re gonna do it. I hope you let me share your story on the blog after. I love when I read personal challenges like this. I know what you feel like when there’s not much left in the monthly budget but then all these amazing deals pop up. It has always been a tough call for us an in part why were are continuing the grocery game challenge. You mentioned that you cooked the meat and potatoes and they are in the freezer now. Do you always prep meals and freeze? I’m sure it saves time. If you want to pay your mortgage down faster don’t let anything get in the way. I don’t know if you read our story but we paid our mortgage in 5 years… lots of sacrifice but 3 years mortgage and debt free is still amazing. You can do it!!! Do you both eat lots of eggs? We buy lots too so I’m just wondering. Is this what you currently have in PC Points or what you’ve earned since you started collecting them? PC Points Plus Earned to date: 1,006,126 >> nice!! Eucalytus Mint Tea – $1.83  impulse buy! Mini grater – $1.99  impulse buy! Weekly Overview (your final thoughts): Went completely off track the second part of the month…just got whatever was needed, wasn’t paying close attention, ran out of money, had to use other money. Blah! Sorry about the late moderation but I’ve been ill the past few days and still am. I have some questions and I apologize if you’ve already told me or mentioned about it before. How many people are you feeding in the family? Adults, Kids? Is anyone on a special diet? So, your monthly budget for food is $700 and you over-spent by $683.06 in February? Hm, we’ve got some work to do, hehe!! Yes always look at the prices of beef especially pre-cut meat. You already knew that though. 🙂 The little grater we have as well and keep it in a jar with nutmeg and have used it many times. What would you say is your BIGGEST downfall when it comes to sticking to your monthly grocery budget? It’s great that you are working to get it under control. All the extra money you can keep back can go towards other areas of your budget, savings or investments. Mr.CBB 🙂 We’ll get there. What account are you talking about for The Scanning Code Of Practice? The last thing that my daughter made with crescent rolls was mini pigs in a blanket but we have used them when making cheeseburger cups as well. Neither are not on the menu this coming week but could well end up the following week. I’m doing okay with my grocery budget but definitely not like last year. I’m definitely looking at the pink stickers this year and that seems to be offsetting the price matching so I think it will all come out the same by the time the year is over. Hmm, I wonder if our son would eat the cheeseburger cups. Are you finding it tough to get bargains like you did last year? If your son likes sloppy joes and cheese, then he should like Cheeseburger Cups. You can play with the ingredients for the sloppy joes, cheese and even the “cup” to make it fun for him. Not sure if it’s the bargains that’s harder to find or if my tastes are changing. You gave me the idea of tracking my grocery savings which include pink stickers. I’m finding more pink stickers this year than in the past but then I’m also looking for them, where I really wasn’t before. This year, I’m finding that I’m spending most of my grocery budget whereas last year, I had a few weeks where I had leftover $ and therefore could put that on my debt. After a hefty $$ shop last Sunday in the US, that I am posting this week, we are just coasting along and eating from our pantry, fridge and freezers. We really don’t have any choice…I have everything fully loaded! We have to have at least one NO SHOP WEEK on the Canadian side of the border in a month to make our budget work…this however is our second in a row! Yay us! In the interim we have a couple of pounds of grape tomatoes, English cucumbers, iceberg lettuce, green cabbage, onions, potatoes, celery, shallots, green onions, red & yellow onions, carrots, assorted apples, lemons & limes in the fridge to work our way thru not to mention frozen spinach, peas, mixed vegetables and broccoli. I think we’ll survive the week, don’t you? $ 95.70 Holiday Season Fund + $160 RCSS POINTS + $10 Dream Air Miles. OUR CURRENT TOTAL UNUSED RESERVES ARE $1,191.70. This means the $1,274.44 that we carried forward from 2016 PLUS AN ADDITIONAL $293.29 that we have added in 2017, LESS $376.03 that we have drawn out for use in 2017. I don’t know about now but Spring is officially in Ontario, finally. We’ve been wanting more salads lately as well and probably will do for the rest of the Spring and Summer months. WOW that’s lots of veggies to get though but you both love them so that shouldn’t be too hard. Great deals on the bread PLUS free PLUS senior’s discount… awesome shop! When you say ham slices how big are they? What does Pepper Jack taste like? Next time we go to Costco I’m going to see if they have this. I know you were in the USA but you never know. The medium cheese block is a great price. What brand is it? I want to see if I can find this too. Do they sell the Peppermint Mocha in Canada? Mr CBB…we had pea sized hail today! It’s supposed to be raining all the rest of the week too so it’s not nice weather here yet. Yes we spent a lot on the US shop but it has been 4 months since we shopped south of the border. We’ll shop again in April & May but then not again until September, November and December. Those are some decent sized ham slices. Yes I did like the price of the corned beef. I’ve always wanted to try one here. Mrs. CBB says she loves corned beef. Do you just put it in the crockpot? There are lots of different ways to make it. Usually we just boil it with the seasoning packet but I plan to make a Slow Cooker Maple and Mustard version later in the week. That’s what I was thinking about doing. I love using the crockpot although I’m not the best at it as I’m still learning. I love the idea of maple and mustard to. That would go nicely with the corned beef. I just need to find a good sale on one now.